Okay, now that I have your attention I will begin by saying, that the photo above was just a set-up, but it’s true ... we did go to hospital for Dave’s birthday! “as I look over my notes from the interviews, most of the kids are not happy because of what they have, but they are excited about what they can do”. Dave and I have been thinking about this a lot lately. And asking, how do we encourage this type of thinking in our own three children? 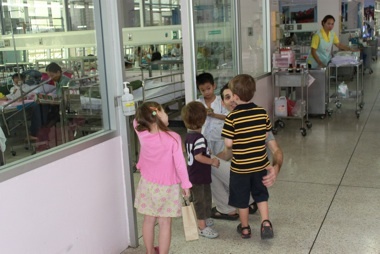 So, this year, in an attempt to be consuming less and giving more; we decided to celebrate Dave’s birthday by using the money that we could’ve spent on presents, or going out somewhere, to buy ‘goodies’ and make bags to give away to sick children at one of the government hospitals here in Chiang mai. After doing a big shop at Makro (like Cash and Carry) the other night, we set about stuffing bags full of treats and toys ready to hand out today. Below is a video of our kids explaining how to make the bags- yes, it was a very organized process! 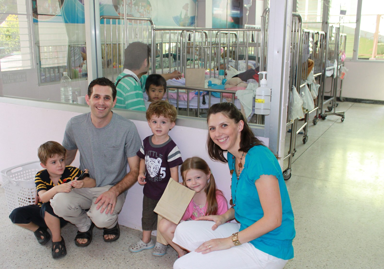 And so today we set off with forty something bags and 6 teddy bears (for the children in an intensive care unit). What a joy it was to see the children’s little faces light up as we came around handing out the bags. Even the parents of babies, or sleeping children sat up eagerly awaiting the arrival of their bag of treats. 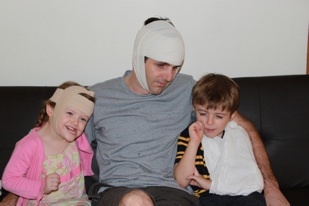 There was no preparing our children for the hospital situation we took them to. Even as an adult, it was an overwhelming scenario to enter, but they did it! And so at dinner tonight, when we asked our children to reflect on their day, they answered, “We were so proud of what we did to cheer up the children at the hospital today”. And you know what? We couldn’t be more proud either. you guys are so selfless every day, I love to hear what wonderful things you have been up to, how you engage your children in these activities. I know I so need to think about how we can do something to help others. Oh Mandy, I thought it would be so easy over here to do this sort of thing, but it still requires a big effort to get something like this happening. It's really hard to be intentional and purposeful in parenting, but we try our best. I think so much of the "teaching" comes before and after the actual event too. Thanks for stopping by!